With a UK tour in April, Michelle Duffy looks back at the history and favourite albums of ECHO & THE BUNNYMEN. 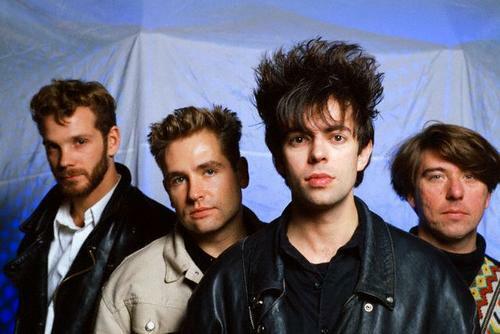 Hailing from Liverpool, Echo & The Bunnymen formed in 1978. Their critically acclaimed debut album, ‘Crocodiles’ was released in 1980 and went straight into the UK Top 20. The unusual cover reflects quite a dark image, which compliments the album perfectly. The English post-punk band continued to have chart success following their album releases, especially with albums such as ‘Porcupine’, which reached number two in the UK, and ‘Ocean Rain’ which gave the world the hit singles, ‘Silver’, ‘Seven Seas’ and ‘The Killing Moon’. ‘The Killing Moon’ was later featured in cult classic film, ‘Donnie Darko’ in 2001. The band split in 1988 after their only constant member, frontman Ian McCulloch, quit. In 1994, McCulloch reformed the band with original members, Will Sergeant (guitar) and Les Pattinson (bass), under the name Electrafixion. They eventually went back to the Echo & The Bunnymen They released five albums with various member changes along the way. After having had a few line-up changes over time and touring extensively, Ian McCulloch and Will Sergeant are the only remaining permanent members of the band to this day. This was the fourth studio album released by the band and is said to still be Echo & The Bunnymen’s best album among both fans and critics. One of the main reasons for this could well be because it features one of their most well-known hits, ‘The Killing Moon’, which reached number nine in the UK Singles Chart. The band’s third studio album reached number two in the UK Album Charts and became the band’s highest charting release at that time. Despite receiving slightly negative reviews at first, ‘Porcupine’ enjoyed success due to featuring the hit singles ‘The Back Of Love’ (no.19) and ‘The Cutter’ (no.8). Following their reformation under the name Electrafixion, the remaining members resurrected the original Echo & The Bunnymen name and released the band’s seventh studio album in 1997. After having received positive reviews from both critics and fans, it reached number 8 in the UK Albums Chart. This self-titled album was the fifth studio album to be released by the Liverpudlian boys. It was the last album featuring drummer Pete de Freitus before he tragically died in a motorcycle accident in 1989. Despite featuring another of their big hits, ‘Lips Like Sugar’, and receiving a warm reception in America, the band disliked the album.